Citation Information: J Clin Invest. 2019;129(2):863-874. https://doi.org/10.1172/JCI123980. Visually impaired rhesus macaques have electroretinography tracings characteristic of achromatopsia. An example of an electroretinogram (ERG) tracing from the eye of an unaffected macaque (A) is shown. 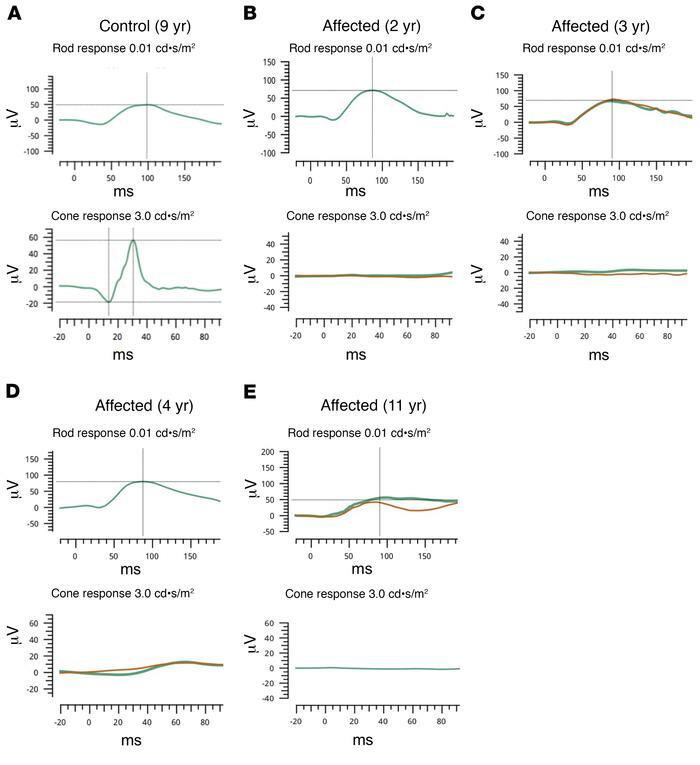 Normal amplitude and latency is observed in the control case in both the rod-mediated (A, top row; dark adapted state, 0.01 cd•s/m2 stimulus) and cone-mediated pathways (A, bottom row; light adapted state, 3.0 cd•s/m2 stimulus). Affected subjects (B–E) noted to have visual impairment have relatively normal rod-mediated waveforms with perhaps subnormal amplitudes (B–E, top row). By contrast, affected animals (B–E, bottom row) have nonmeasurable cone-mediated recordings at 2 (B), 3 (C), 4 (D), and 11 (E) years of age, respectively. Green traces indicate initial testing. Orange lines indicate repeated testing during the same recording session. μV: microvolts, ms: milliseconds.